This month’s featured pub is the Bankers Bar, one of the last remaining traditional Irish pubs in Dublin. 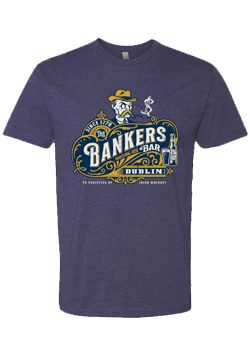 Nestled between the Temple Bar and Grafton Street neighborhoods, the Bankers Bar is in the heart of Dublin City. Originally the building was used as a bank and still has old safes and vaults lurking in the depths of the building. The pub dates back to at least 1779 and although it has evolved and grown throughout the years it has always been a warm and welcoming spot with a pleasant mix of both Dubliners and visitors. The Bankers Bar now boasts over 70 varieties of Irish Whiskey, loads of locally brewed craft beers, and serves food in an upstairs dining room aptly named the Teller Room. Whilst owner Alan Campbell has thoughtfully shepherded the Bankers into modern times, he has been careful to let the spirit and history of the pub shine through. Next time you are in Dublin be sure to stop in and experience it all for yourself. December’s pub was Nancy Hands located in Dublin City next to the grand Phoenix Park and a short stroll from the Guinness Storehouse, the Jameson Distillery, and the National Museum at Collin’s Barracks. This long established, authentic Dublin pub offers the real Irish drinking and dining experience. Upon arrival, the first thing you will notice is the authentic Victorian bar, an original staircase from Trinity College (trodden by Michael Caine in the film Educating Rita), and a collection of rare “Guinntiques” describing a lifetime of Guinness advertising. 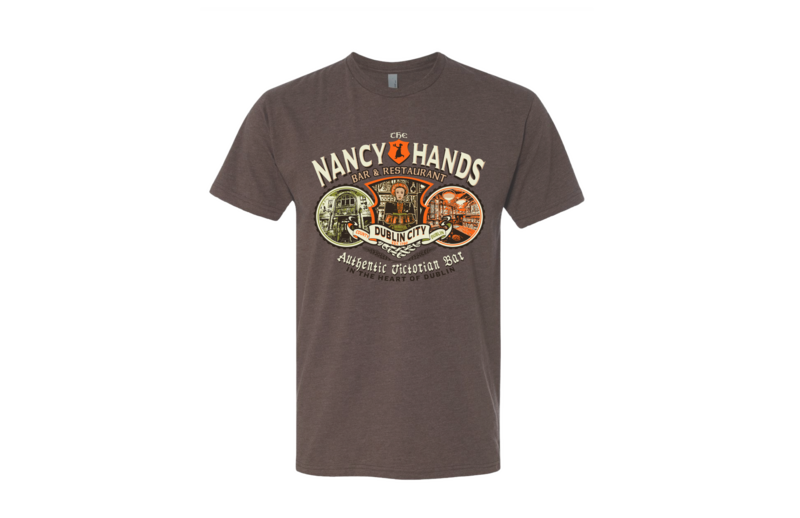 Nancy Hands is the place to be if you want to experience a traditional Irish dinner – complete with storytelling, music, dancing, and even breadmaking and Irish coffee demonstrations. Dinner specials including beef and Guinness pie and the hearty seafood chowder cannot be missed. Wash it all down with a few pints of Guinness and you’ll be well on your way to the perfect evening in Dublin. November’s pub was The Spinnaker Bar & Restaurant located in the lower village of Dunmore East in County Waterford. The Spinnaker is reminiscent of former times, with old stone walls, wooden and flagstone floors, stained glass, and a hint of the monastic origin in some of the woodwork and furnishings. Old style mirrors and artifacts adorn the walls, and in winter a crackling log fire will warm the cockles of even the hardest heart. 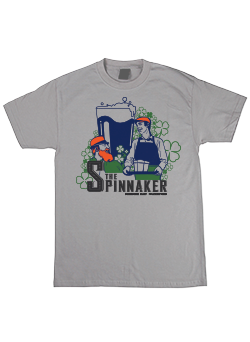 The Spinnaker is a relaxed place to enjoy a few sociable drinks with friends or while listening to trad session. They are also known for their award winning food - the famous seafood chowder is the perfect way to refuel after a long day of exploring the beautiful area. Be sure to pop in to the Spinnaker next time you are in Waterford and experience the inherent charm, character and hospitality that they have to offer. 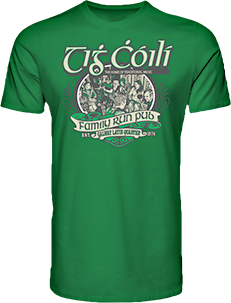 This month’s pub is Tig Coili, a buzzing family run pub located in the heart of Galway City’s Latin Quarter. Known as the home of traditional Irish music, Tig Coili hosts 2 live trad sessions each day throughout the entire year. This pub has found the perfect balance between locals and visitors, creating an authentic, welcoming environment for all. Talented musicians both young and old, come from near and far to play each night, and guests are always rewarded with brilliant music, a lively atmosphere and delicious pints. No trip to Galway is complete without a visit to Tig Coili – so be sure to stop in for some ceol agus craic (Irish for music and fun) during your next visit. 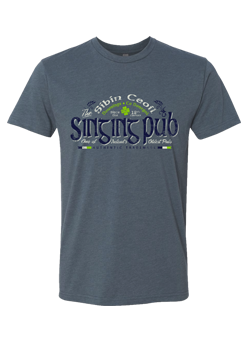 August’s pub was the Singing Pub, or Síbín Ceoil, in the town of Downings, County Donegal. Perched in a stunning location along the scenic Atlantic Drive in the very north of Donegal, the Singing Pub is housed a traditional thatched Irish cottage and is bursting with character and charm. Visitors are welcomed to the cozy pub by the glowing open turf fires, comfortable seating, and friendly service. The food here is not to be missed – the pub is famous for it’s fresh locally caught seafood dishes, massive steaks, and of course, a great selection of beers. The Singing Pub has been quenching the thirst of locals since the early 18th century, making it one of Ireland’s oldest pubs. 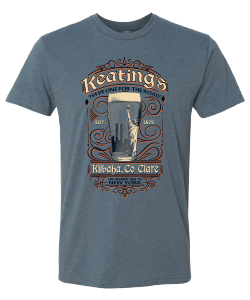 In its formative years it operated as a Síbín, or an unlicensed premise. Now, having been in the Doherty family for over 30 years, the pub is a warm and welcoming place not only for visitors and locals, but also for the many musicians who have helped the Singing Pub become famous for it’s trad sessions. July’s pub was Mellett’s Emporium in the town of Swinford in County Mayo. 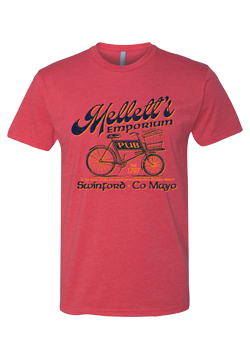 Mellett’s Emporium was opened in 1797 by Stephen Mellett and has been in the same family for seven generations! Originally, the property consisted of a retail shop in the front and a bar in the back. It was the village’s general store with one long counter where you could buy groceries and tobacco, book your journey to the US or England, or even arrange a funeral. Talk about a one stop shop! Mellett’s was renovated in the 1980’s, but still retains its original character. The pub is crammed with memorabilia from the past that have accumulated over the years – you’ll even find a few coffins left over from the funeral business, as well as some vintage cars in the beer garden out back. If you are looking for a bit of history with your pint Mellett’s Emporium is the place to be – its story is tied tight with the history of Swinford and with seven generations of the Mellett family. June’s pub is the Old Ship, established in 1796 in Arklow, County Wicklow in the southeast of Ireland. Full of nautical memorabilia, the interior of this friendly pub resembles the hull of an old sailing ship – a tribute to the history of the town. Arklow was formerly one of the busiest ports in Ireland and was a renowned center for boat building and sea fishing. The welcoming staff will make you feel right at home, and the pub boasts hearty portions of home-cooked food. You’ll be happy to know you can order a full Irish breakfast all day long, and they always serve up a proper pint on Guinness. 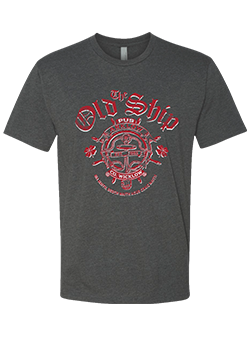 The Old Ship is a great place to watch sports, catch some live music on the weekends, or to mingle with the great mix of locals and visitors. If you visit The Old Ship you’ll be well looked after, and will quickly understand their guarantee of good food, good drink, and good craic. May’s featured pub is The Blind Piper in Caherdaniel, County Kerry. Located on the Wild Atlantic Way and the famous Ring of Kerry, this bright yellow pub is a welcoming site for weary travellers. Situated along the Coomnahorna River, the Blind Piper is close to some of the best beaches in Kerry including the must-see Derrynane beach. The smell of peat burning on the open fire will draw you in on a rainy day, and once inside you’ll be enchanted by the dark wood, stone floors, delicious food, and a good variety of beer. It is easy to lose track of time at The Blind Piper as you become engrossed with the live traditional live music, friendly banter, and good old Irish craic! April’s featured pub is the popular Locke Bar in the heart of Limerick’s medieval quarter. 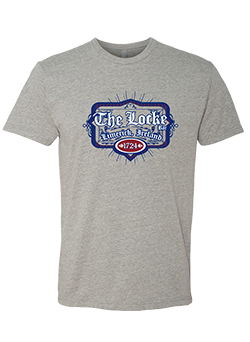 The Locke has everything you’d expect from a true Irish pub, including friendly staff, extensive drink selections, fabulous food, nightly traditional music and dancing, and a beautiful location. This pub is welcoming during any season – with warm open fires in the winter, and a large beer garden overlooking the lovely River Abbey in the summer. Situated on the original site of one of Limerick’s oldest pubs dating back to 1724, the Locke is a stone’s throw from the city’s most historic landmarks – St. Mary’s Cathedral, King John’s Castle, and the Hunt Museum. Weather you are in search of a perfect pint, some soul-warming Irish stew, lively traditional music and dancing or a place to relax and refuel, the Locke in Limerick is certain to satisfy you. March’s featured pub is the Marine Bar in County Waterford. Situated in Drum Hills in the village of Pulla in Dungarvan, this family run traditional pub sits along the main road between Cork and Waterford and is known for its lively year-round Irish music sessions. While many assume the name refers to the local community of fishermen, that is not the case. The bar has a rich history dating back to the 18th century when the Marines marching from Cork Harbor to Waterford Harbor were in need of a place to quench their thirst after a long climb through the hills. The sergeant persuaded a local widow to open a shebeen inside her cow shed, a few barrels of whiskey were rolled in from the secret still in the hills, and thus the Marine bar was born. February’s featured pub is the Spirit Store in Dundalk, County Louth. 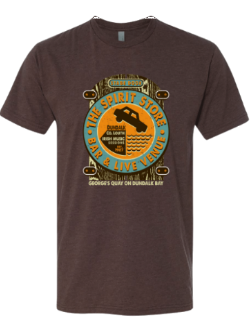 Tucked into the docks of George’s Quay on Dundalk Bay, the Spirit Store is both a traditional pub and a live performance venue. On the ground floor you’ll find a cosy pub full of nooks and snugs perfect for sipping some whiskey, wine, or a few of the Irish craft beers on tap. Upstairs is a small venue that hosts top-notch music and comedy acts, attracting talented performers from all over Ireland and abroad. You’ll always find a diverse group of people here – local fisherman and musicians mix with locals and visitors to create a warm, welcoming, and always lively atmosphere. On a sunny day there is outdoor seating where you can watch the boats pass by and take in the beautiful scenery of the nearby Cooley mountains in the background. On Sunday evenings you’ll be delighted by free Irish music sessions – the perfect way to wrap up your weekend. January’s pub is the Slieve Bloom Bar, a family run pub in the village of Kinnitty, County Offaly, smack in the center of Ireland. The large black and white building dates back to the 1800’s and is a welcome stop for walkers, bikers, scouts and anglers, as it is nestled in the breathtaking Slieve Bloom Mountains. The pub has been in the Clements family for over 50 years and is a great spot to learn about the local history and folklore as you sit around the warm fire and sip pints. The walls are adorned with historic memorabilia, and there are beers to suit all tastes. Current owner Kieran Clements will make you feel as if you are a guest in his home, and will see to it that you are well looked after. 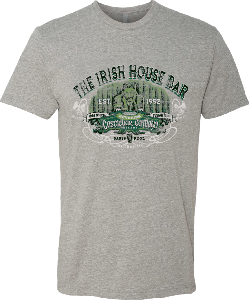 With December's pub shirt, we are proud to feature the Reel Inn in Donegal Town, County Donegal. Recently voted the Best Pub in Ireland for 2017 at the Irish Hospitality Awards, The Reel Inn is the Irish pub of your dreams. Owners Denise and John McMenamin opened the pub with the goal of creating an authentic traditional Irish pub and a welcoming space for musicians – and boy have they succeeded! With brilliant live music 7 nights a week (typically led by John and his red squeezebox), the small pub usually fills to capacity, creating a buzzing atmosphere. Inside you’ll find walls clad with old photos and instruments, and framed song lyrics about the pub written by devoted customers. Here you will feel at home having a few delicious pints while you get caught up in conversation or join in with the songs. The Reel Inn is a truly special place - you won’t find a more welcoming or authentic pub in Ireland. If you happen to wander through the narrow passageway off Dame Street in Dublin you’ll stumble upon a true gem. Though a tavern has existed at this site since the 1780’s, The Stag’s Head was opened in 1894 by popular British merchant George Tyson, and was the first pub in Dublin to enjoy electric light. It is arguably Dublin’s best preserved Victorian pub complete with a mosaic floor, wooden snugs, and a long mahogany bar. Tucked quietly behind the main bar you will find a cozy parlor lounge that used to serve as a fashionable Victorian smoking room. 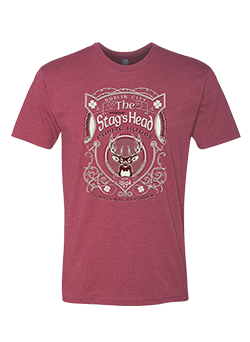 Once inside you’ll quickly understand why The Stag’s Head was recently crowned the ‘Best Pub in Ireland’, and after a few pints you’ll never want to leave. With it’s history and charm set firmly in the Victorian era, the pub has aged with ease and now hosts weekly comedy gigs, ukulele jams, and trad music sessions. Whiskey fans take note – the pub boasts a selection of nearly 70 varieties of Irish whiskey! This month’s pub, An Crúiscín Lán in County Cavan, takes its name from the familiar Irish folk song of the same name. An Crúiscín Lán, or “the full jug”, is a tune that gives praise to the ancient god of wine in hopes that he keeps our jugs full of drink. Your glass will never run dry at An Crúiscín Lán, located on Main Street in quaint Cavan Town. The interior of the pub boasts rustic exposed stone walls and a long inviting bar where you can belly up for one of the best pints of Guinness in the county. Here you’ll find locals playing darts and watching GAA, horse racing and other sports on the TVs. Visitors often stop in to refuel after exploring the nearby Killykeen Forest Park. September’s featured pub is Beár An Ráille (a rough Irish translation of "The Railway Bar") located by the train station in Roscommon Town, County Roscommon. Owned by brothers Dale and Dermot Kiernan Beár An Ráille feels like home, but somehow better. The pub is a local hangout for people of all walks of life – inside you’ll find local punters, wide eyed tourists and state solicitors all sitting and mixing together. Everyone gets the same treatment- a warm and friendly welcome and, if they think you're up for it, a bit of slagging (teasing). 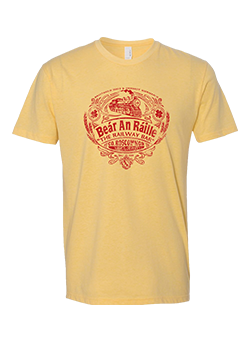 Beár An Ráille’s inviting red and yellow exterior leads to a cozy traditional interior complete with wood floors and ceilings, a warm wood stove, and plenty of character. The pub is a relaxed spot for watching local sporting events, catching live music or playing a round of pool with friends. 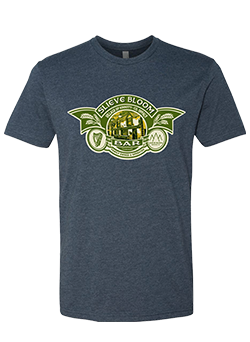 They have also become known for their annual fundraisers for Blood Bikes West – a volunteer run organization that delivers essential blood and urgent medical supplies via motorcycle throughout the West of Ireland. This month’s featured pub is The Snooty Pig - one of the oldest pubs in Tipperary Town. It was first named after its original owner, Annie Breen, but current owner Mary Dalton renamed it The Snooty Pig, as in bygone years there had been a piggery at the rear of the premises. The pub is a place where old friends meet and new friends are made, and where song and laughter can always be found. With regular live music nights, dart boards, a juke box, card games and pool table you’ll be constantly entertained by the friendly staff and locals. 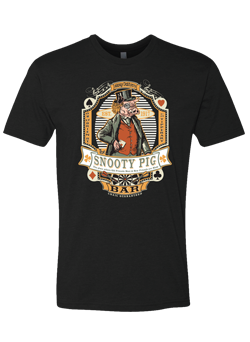 The Snooty Pig is the place to be if you want to try your hand at skittles – the ancestor of ten-pin bowling that has remained popular in rural Ireland. The pub runs frequent tournaments throughout the year where you can join in or observe from the comfort of the outdoor beer garden. Either way, some serious craic is guaranteed! July 2017’s pub is The Harp Tavern in County Sligo in northwestern Ireland. The Harp is located in the center of Sligo Town, on the banks of the River Garavogue and in the shadow of the breathtaking Benbulben Mountain – an iconic image of the region. 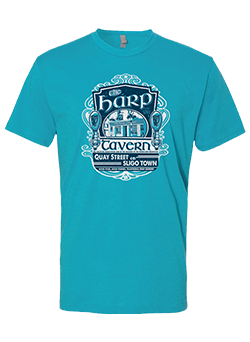 Popular with locals and visitors for its warmth and friendliness, The Harp is a great place to listen to local musicians, cheer on your favorite GAA team, or strike up a spirited conversation. With a woodstove tucked in the corner, warm whiskey drinks, and creamy pints of Guinness, you’ll have no doubt you have found one of the coziest and genuine pubs in all of Sligo. 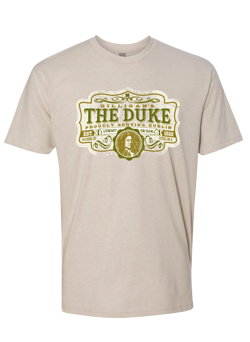 The Duke, which takes its name from the little street named after the 2nd Duke of Grafton, has been providing liquid refreshment and sustenance to the people of Dublin since 1822. Dripping in history and character, the pub is renowned for providing patrons with a place of quiet respite to enjoy a peaceful drink or some heart warming food throughout the day. Because of its central location in the pulse of the city center, The Duke has enjoyed a distinguished association with many of Ireland’s literary greats. James Stephens, James Joyce, Oliver St. John Gogarty and Arthur Griffith breezed into The Duke regularly in the early days of the century when they wanted a quiet reflective drink. You can now walk in their footsteps, as the Duke is the starting point for the world famous Dublin Literary Pub Crawl. Tom Gilligan is 12th in a line of owners who have all taken great pride in preserving the history and culture of this charming Victorian pub. Today, just as Dubliners have for done for almost 200 years, you can stop in for a friendly pint served up with a slice of history. May’s pub is a true hidden treasure. Jim of the Mills is legendary-often touted as the best pub in Ireland, most certainty for it’s guaranteed craic, warm hospitality, and brilliant music sessions. Open only one night each week and with just one beer tap, Jim of the Mills is the embodiment of a quintessential family-run Irish pub. Tucked deep in the rolling hills of Upperchurch in County Tipperary, Jim and Kae Ryan along with their five daughters, welcome locals and visitors from around the world into their home each Thursday night. If you are lucky enough to visit this pub you’ll quickly understand the music-loving family’s promise that if you come with a smile you’ll leave with a bigger one. The quaint farmhouse has been in the Ryan family for over 200 years and functioned as a mill for much of that time. The pub’s 3 small rooms, stone floors and massive turf fireplace are steeped in local history and tradition, and if the walls could talk, they’d sing. Music is at the heart of everything at Jim of the Mills – as musicians young and old gather each Thursday to play local songs and traditional tunes all from the heart. 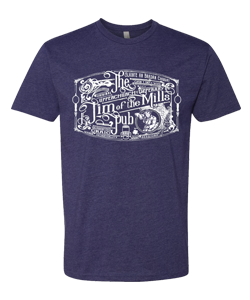 Jim of the Mill’s energy is the stuff we all dream of – make a trip there and you’ll feel like you’ve found a pot of gold at the end of an Irish rainbow. The Irish House Bar in the center of Castlebar in County Mayo is as Irish as it gets. This cozy traditional pub is overflowing with Old World charm and character. You’ll fall in love with just one glance - the outside features an old stone façade, a cheerful green and yellow entryway, and outdoor seating on sunny days. Inside you’ll find a wood-clad interior that holds relics from the past, cozy nooks for rainy days, and pints poured by friendly staff. In 1893 Mr. James Heverin opened The Irish House as a general drapers shop which sold fabrics for clothing. The local press at the time described the shop as one of the “finest business establishments west of the Shannon River.” Mr. Heverin’s business thrived until the 1950’s when the shop was split into two commercial units – one which now houses the Irish House Bar which was opened by the original owner’s great grandson in 1992. The other half is home to A Stór Ladies Boutique. Both businesses are now proudly being run by the 5th generation of Heverins to occupy the building. 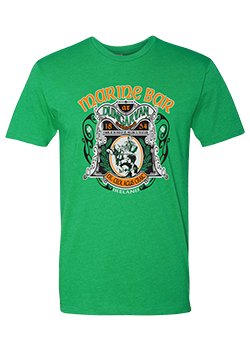 March’s Pub Shirt features The Auld Dubliner, located in the beating heart of the Temple Bar district, is a must on any trip to Dublin. 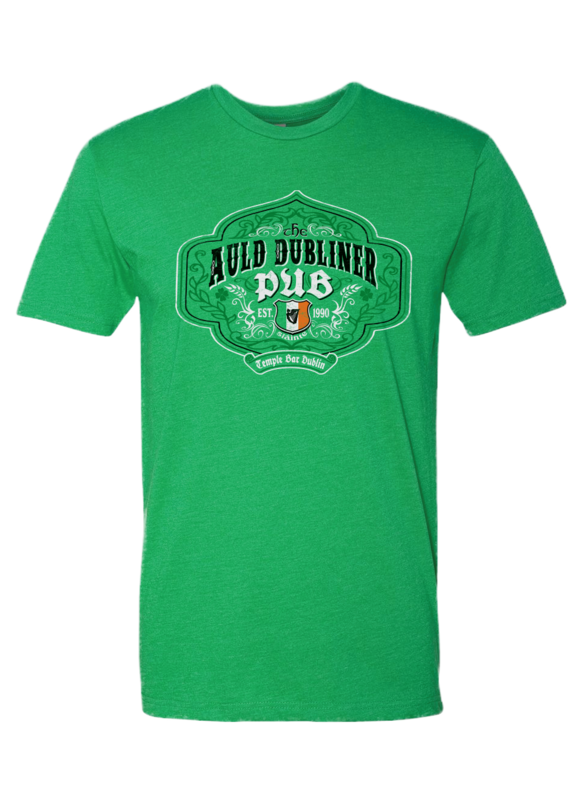 Known for their friendly staff, proper pints, and live music 7 nights a week, the Auld Dubliner has become one of Temple Bar’s most popular watering holes be it day or night. The pub is just a block from the River Liffey, and surrounded by all of the vibrant pubs, shops, museums, and top sights the City has to offer. Whether you are in the mood for a lively pub atmosphere, a cozy spot to grab some traditional Irish comfort food (try the Dublin coddle made from Molly Malone’s original recipe), or a place to watch a rowdy rugby match you’ll find your place at the Auld Dubliner. 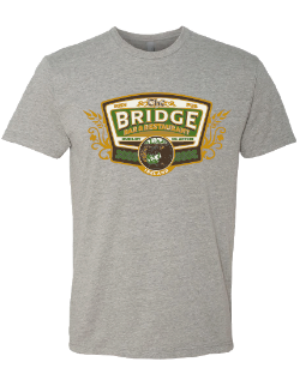 February’s Pub Shirt features The Bridge Bar and Restaurant which was established in 1896 and is located just outside the village of Dunloy. The Bridge Bar is well-known for good, home-cooked traditional Irish fare along with all your favorite brews and drinks. It has an established history for music entertainment and good live music. 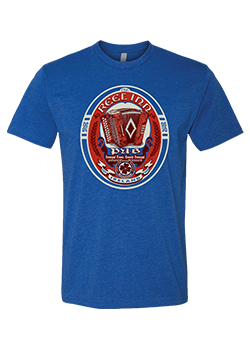 Join the Club today and get this limited edition t-shirt! 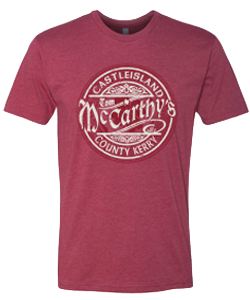 The original building of McCarthy's was constructed in 1875 by a Swiss-Italian gold prospector called John Bonguelmi, who, after making his fortune in the goldfields of Ballarat, Australia and Westport, New Zealand, married a local woman he had met in Australia. Her name was Margaret Horan and she was from Castleisland. They married in New Zealand then returned home and built The Chute Arms Hotel, which opened its doors in 1877. It was a purpose built "hotel" and included servants quarters, a coach house, and, of course, the Bar area. It was built from local limestone that was salvaged from the old Norman Castle that gives the town its name. In 1952, the hotel was sold to a local farmer John McCarthy and his son Tom, who ran the pub. Tom’s youngest son, Tom, took over the pub in 1997 and is still running it today with the help of his family. Next year, 2017, will see the historic pub opened for its 140th year.If you’re looking for a traditional Irish family run pub with a genuine family feel, look no further than Tom McCarthy's, The Central Bar, 40 Main Street, Castleisland. County Clare is one of the top spots in Ireland to hear traditional Irish music, or trad for short and Morrissey’s Village Pub is no exception! Located in the heart of beautiful Carrigaholt village, Morrissey’s lively atmosphere is bolstered by regular trad music nights and dance sessions. Visitors come in to enjoy a pint of the world renowned Carrigaholt Guinness and some music and Irish dancing. 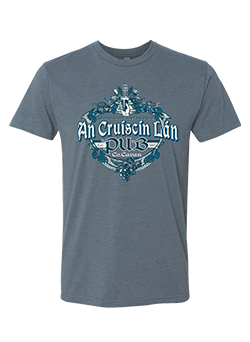 Our shirt features the iconic Carrigaholt Castle, the town’s most distinctive local landmark that stands over the end of a fishing pier on the River Shannon. 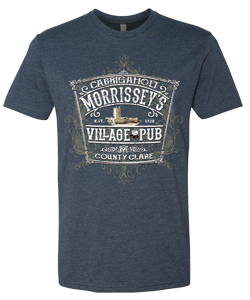 Don’t miss a trip to Morrissey’s Village Pub - whether you’re in the mood for music, dance or a chat by the fire, you’re always welcome at Morrissey’s. The Drift Inn in Buncrana, Co. Donegal finds its home in an old railway station built in 1863. In 1953, the station was converted into a public house while maintaining its original structure and details such as the platform and water tower in the back of the building. The Drift Inn has a strong connection to the sea, being integrated into a fishing town, with fishing nets as decor, a boat-shaped bar, and fresh fish from Greencastle. 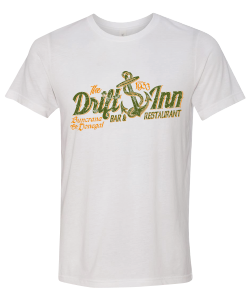 The Drift Inn prides itself on the rustic charm, and fresh, high-quality, local meat and vegetables to craft its award-winning meals. The Drift Inn has a large selection of alcohol, leaving no meal without a perfectly paired drink. The Drift Inn embodies the culture, food, drinks, and atmosphere Ireland is known for. The Knights Inn is a fourth generation, family-run pub located in the Town Centre square. The town of Newcastle West grew around a castle Desmond Hall, and the castle ruins, which are well-maintained, are located right off the town square in full view of the Knights Inn. The Knights Inn is a local bar where regulars often come to chat, watch sports and have a bit of craic. 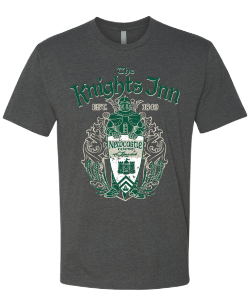 We featured the Knights Inn for October since the name evokes a little “Halloween” feel - it could be creepy but it’s really fun. Known for it’s iconic red building and rousing entertainment, Murphy’s Pub is a popular spot for locals and visitors to Dingle. 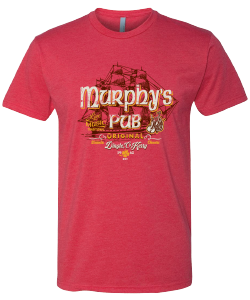 Our shirt features a centuries old fishing boat set against the famous deep red of color of the pub. Aside from its large selection of beer, Murphy’s is known for their locally caught Dingle Bay seafood – lunch or dinner at Murphy’s should not be missed. A night out at Murphy’s will almost always include music; with local musicians performing both modern and traditional Irish songs. 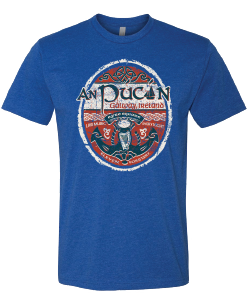 An Púcán takes its name from a traditional Irish fishing boat used in Galway Bay, so we featured that boat within the design of our bold, blue July shirt. Located off Eyre Square, An Púcán is a great live music bar featuring traditional Irish music, cover bands and DJs. The bar is also known for its extensive Whiskey menu and is even a part of the Galway Whiskey Trail. 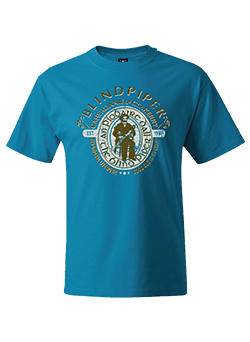 Our very first shirt had to be unforgettable! And yes, this 100+-year old pub is really named after a roaring donkey. Many, many years ago, the bar was a shop/pub frequented by farmers who used to tie their donkeys and carts outside while they went inside to have a drink. Of course, one drink turned to a few and after some time the donkeys would start braying…hence the nickname, which eventually turned into the real name. 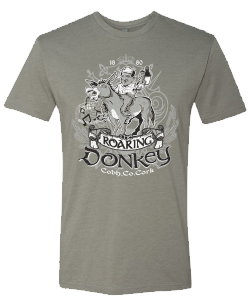 We immortalized this on our premiere shirt, with a trademark “roaring” donkey and the year the pub was founded, 1880. Today, the pub is known as THE place to go for rugby viewing, live music, and great craic (fun).